We continue to systematically study the perspectives of investors with the best long term track records. Some are listed in the chart below. In addition to displaying their record of out-performance over the S&P500, the chart also includes the number of years the out-performance was maintained. 1. Does the company have a long record (10 years) of earnings with an almost unbroken record of rising earnings? 3. Does the company have low debt? 4. Is the company a leader, preferably THE leader in its field? 5. Does the company have entrenched corporate management? 6. Is there a broad and liquid market for company shares? One word of caution though is currently warranted for investors searching through the high grade/low yield companies. Investors have been chasing fixed income yield. Because of absurdly low rates, some income investors have shifted money into consumer non-cyclical stocks. But valuations still matter. In the recent finale of Mad Men, Advertising executive Don Draper appears to create the iconic 1971 Coca Cola Hilltop commercial (link to YouTube). 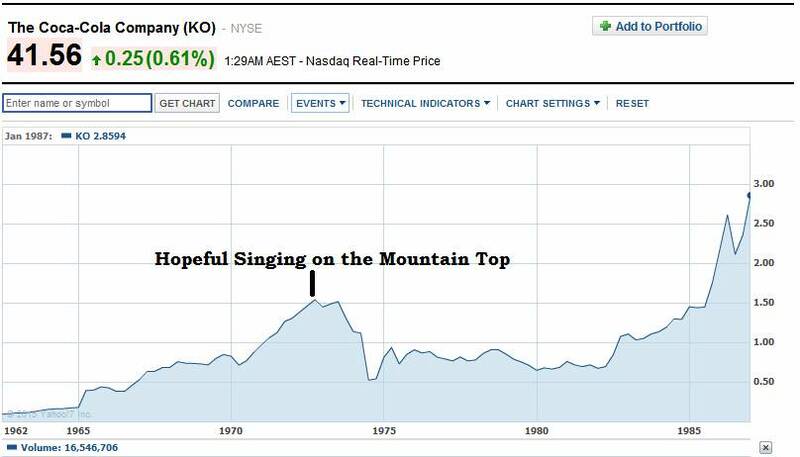 Coke is still a great business but with its trailing multiple approaching ten year highs (25x+), investors moving in from bond land should hope that only the Hilltop Ad is being replayed and not the subsequent stock performance (see below). We have been concerned about riskier bonds at such low yields for some time now. A further discussion of their unattractiveness can be found here and here. Not only are returns low by historical standards, fundamentals worsened as prices increased. For instance, median leverage for investment grade corporate is the highest ever. Citigroup notes that corporations brought on the extra debt to pay dividends and not to make investments in growing business. Corporations have been known to issue shares to retire debt. Investors buying shares for the debt fueled dividends could find their interests diluted. “Because investing evokes emotion, advisors need to help their clients maintain a long-term perspective and a disciplined approach – the amount of potential value an advisor can add here is large…Advisors, as behavioral coaches, can act as emotional circuit breakers by circumventing clients’ tendencies to chase returns or run for cover in emotionally charged markets. In the process, advisors may save their clients from significant wealth destruction and also add percentage points- rather than basis points - of value. A single client intervention, such as we just described could more than offset years of advisory fees.” – Vanguard Research. According to the most recent Annaly Capital Management report, “Approximately 52% of global government debt is yielding 0% or less.” Due to the negative interest rates, Spanish bank Bankinter is paying mortgage holders’ principal. Bank depositors are allowing bankers to give their money to homeowners to help pay the mortgage. In this low interest rate environment, Europeans are finding an alternative: gold. In the first quarter, German gold purchases were up 20% with France, Switzerland and Austria up double digits. BHP has spun off South32 to its shareholders. Recall that South32 is an Australian-listed global aluminum and metals mining company which includes the Cannington Mine, the largest (and lowest cost) silver mine in the world. As Greenblatt says; “Insider participation is one of the key areas to look for when picking and choosing between spin-offs – for me, the most important area.” Joel then goes on to describe a successful spin-off in 1993 of Marriott International. To paraphrase, the CFO of the parent company became the new CEO of the spin-off with a large allotment of shares to ensure the new company did well. Which is why in January, we relayed; “BHP Chief Financial Officer Graham Kerr is the new CEO of the spin-off. Compensation details (dependent on the initial spin-off share price?) to follow in March.” According to the South32 Australian Listing document, we now find out that 71% of Mr. Kerr’s compensation will be dependent on the share price. We continue to seek out value. Analyzing different mining companies has been fascinating work. But we are not caught up in ‘the romance of buried treasure’ as Philip Carret would say. We will acquire companies that will offer attractive rates of return over a multiyear period. Large portions of the account will remain in Treasury Bills and precious metals, until overall conditions become more favorable. Copyright ©2015 Lamont Trading Advisors, Inc. Paul J. Lamont is President of Lamont Trading Advisors, Inc., a registered investment advisor in the State of Alabama. Persons in states outside of Alabama should be aware that we are relying on de minimis contact rules within their respective home state. For more information about our firm visit www.LTAdvisors.net, or to receive a copy of our disclosure form ADV, please email us at advrequest@ltadvisors.net, or call (256) 850-4161.